Ultimate is not something that I throw around lightly, especially for vegan brownies. I've had my share of vegan and regular brownies and been baffled by how lacking vegan versions are. Growing up on my Grandmother's brownies, I learned that a good brownie should be dense, fudgy and soft; not light, cakey and dry. Why is it so hard to emulate a traditional brownie recipe that simply consists of a few simple ingredients? Hint: it's due to the egg, which emulsifies, binds, slightly leavens then bakes up as part of the actual base of the brownie itself. To emulate this takes an expedition deep into the innards of brownie science, oh and for me, about seven years of failing until figuring this out. I started by emulating two eggs with water and golden flax meal. I then added some baking soda to the flour to emulate egg's subtle leavening tendencies. Cocoa powder along with semi-sweet chocolate and espresso powder allows the complex chocolate flavors to truly shine. I tested these brownies with canola oil but later settled on Vegan Butter or margarine because it allowed the flavor to mingle and slightly evolve along the flavor profile, rather than diminishing in a downward spiral which was the case with canola oil. This is why chocolate baked goods with canola oil rarely match up to chocolate baked goods with Vegan Butter or margarine. In order to make dense, soft vegan baked goods like brownies and cookies that are similar to their egg-laden counterparts, the dough must be extremely thick because the egg is not going to be there to act as a structure builder as flour does. Thus, you have to add extra flour so it can take over for the egg. The result of this vegan brownie R&D is a dense, fudgy, soft brownie with a complex chocolate flavor. Update: I originally developed this recipe to call for 35 minutes of baking on the lowest oven rack position in your oven. Many commenters came forward with their results and it started to become clear that a shorter baking time on the middle oven rack position could actually improve the flavor and texture of the brownies. After some additional testing, I've confirmed that baking on the middle rack for 25 minutes actually yeilds softer, chewier, fudgy, more flavorful brownies with fruitier chocolate notes! It looks like the longer baking time I originally called for was cooking off some of these more volatile chocolate flavors. I'm thrilled that your helpful input was able to help me make this recipe even better! In a small mixing bowl whisk together the water and flax meal. Let it sit for about 10 minutes so the mixture gets goopy. Ensure your oven rack is in the middle rack position. Preheat your oven to 350F (177C). 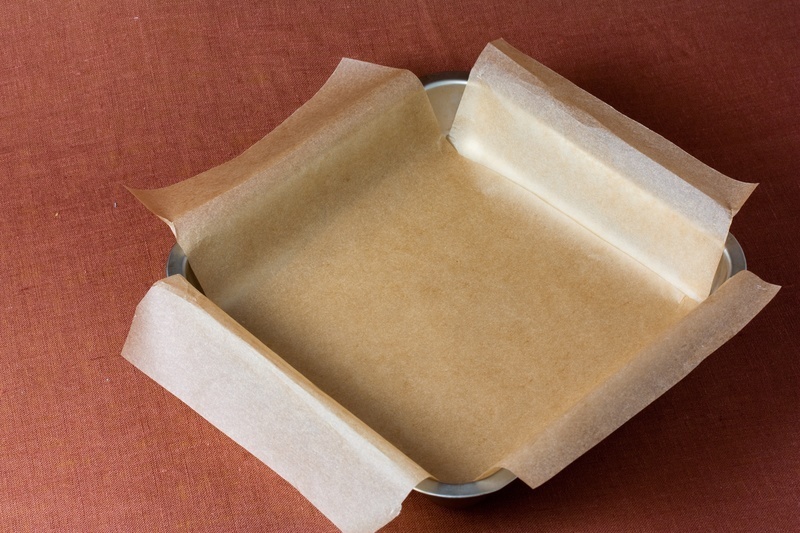 Line an 8 x 8 inch baking dish with parchment paper allowing excess parchment paper on opposite sides so you can pull the brownies out of the baking dish later. In a medium mixing bowl whisk together the all-purpose flour and baking soda. Set aside. In another medium mixing bowl add the cocoa powder, semi-sweet chocolate, espresso powder and salt. Add the boiling water and using a spoon, mix in the ingredients into a paste, making sure that all of the chocolate pieces are melted. Add the sugar, Vegan Butter, vanilla extract, flax meal mixture from Step 1 into the chocolate mixture and mix with an electric mixer until smooth. Stir in the walnuts if you're using them. Using a spoon, mix in the flour until well combined. The mixture will become extremely thick and you may need to use your hands to mix. Refrain from mixing this dough with an electric mixer at this point; this will overwork the dough and activate too much gluten, negatively affecting the texture of the brownies. Transfer the batter to the baking dish. You may need to use your fingers or a spatula to press the thick dough into place. Bake for 25 minutes on your oven's middle rack. Transfer the baking dish to a wire cooling rack and allow it to cool for about an hour. Transfer the brownies to a cooling rack by lifting them out of the baking dish by taking hold of the exposed parchment paper on each side. Allow them to cool completely before slicing into squares. 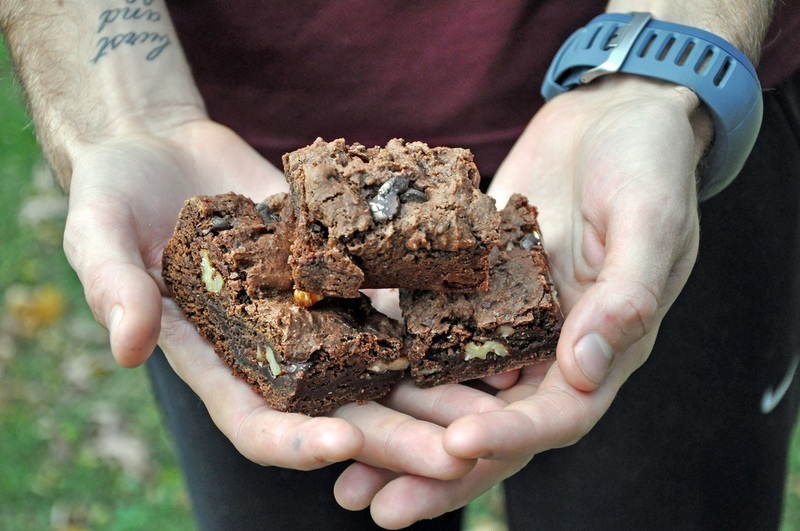 This recipe makes one 8 x 8 inch baking dish of Ultimate Vegan Brownies. A big thanks goes out to (never home)maker for the above picture. Get a price on the Organic, Fair Trade Certified Cocoa Powder I Recommend at Amazon. Excellent recipe, probably the best brownies I've tasted. I suspect that vegan brownies are a good choice to make because your aren't trying to make something light and fluffy without eggs, you are making something nice, gooey and chocolatey. I have found best result when using a ceramic tray rather than a metal baking try. When using a metal try the sides seem to rise making more of a cake. Previous post mentioned not being able to melt the chocolate. I put the chocolate in the microwave until it just starts to melt and then carry on with the rest of the recipe as instructed. The one mistake I have made in the passed was using slightly too much water. It needs hardly any, the mixture seems way too thick but just persevere with it for maximum gooeyness! The espresso and cacoa powder is exactly right. Perfect moisture and gooey ness. Walnuts... blam. I didn’t even have chocolate pieces to throw in there and it was still... yum! I confess, I made mine with infused coconut oil (homemade vegan cannabutter). And before judgement, no it wasn’t that that made this recipe delicious! Cane sugar was the way to go too! Thank you! I have tried so many different vegan recipes that resulted in fails. I was about to give up when I found this gem. These are perfect!! Slight crisp on the outside and so gooey inside. They have the taste and consistency of a traditional brownie. I followed the recipe and I would not change a thing! Thank you!! This has become my default recipe. It actually produces legit, BROWNIES! Not cake. Yay! I make these for my non-vegan co-workers and they inhale them. I am so happy I stumbled upon this recipe yesterday. We were having company over (non-vegans), and I really wanted to find a brownie recipe for dessert that would impress. I've been vegan for nearly 13 years, and this is the best recipe I've tried! Usually my brownies end up cakey or crumbly but these were truly brownies as brownies are meant to be. Took the brownies out of the oven after exactly 25 minutes, then transferred to a cooling rack as instructed. We ate them about an hour and a half later. They turned out completely perfect!! Is there a way to substitute the sugar for a less refined sweetener? Thanks! Looking forward to making these. These are truly exceptional and most people have NO idea they are vegan. I have made them many times with a few little tweaks to the recipe. My suggestion is to cut the sugar by at least half. I usually double the recipe but use only 1 cup of sugar. The chocolate is sweet enough on its own. This rating is great! Nice cakey brownies. Thankyou so much for this recipe! 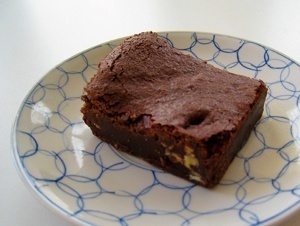 I made this brownies, using brown rice flour and a bit of corn flour because of gluten intolerant people in my family, and everybody was amazed that something vegan could be so delicious! With this recipe you can convince the greatest vegan sceptic to rethink his views!! I doubled the amount of dough and baked it for about 30 minutes. They were still very moist, a little more than yours, but they were fine like that. I think it's due to the different type of flour I used. Greetings from Belgium! Can someone help me please. I really want to make vegan brownie, but when in step 3, I add 1/4 cup (4tbs) to the chocolate and powder etc, there is no way enough water to melt the chocolate. My final product is extremely dry! Does no one else have this problem, am I doing something wrong? This is my go-to brownie recipe. I've made it at least 5 times and these brownies are the ultimate for vegans and non-vegans alike! You will not be disappointed if you are looking for a fudgy, dense brownie with an incredible flavor. Thank you so much! I'll never look for another brownie recipe again!! At last, yummy brownies! 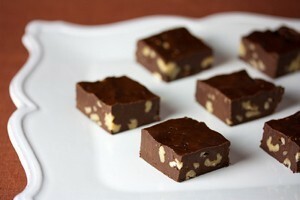 Thank you so much for sharing the recipe, dense fudge and delicious - and easy to make. After trying so many different cake recipes and not really being happy I now know that I can make these without the wrath of five year old boys! ? These vegan brownies are super decadent and delicious. I usually make healthy bean or sweet potato brownies for myself but as I had a foodshare coming up I thought I would try something a bit naughtier. I can't believe these are vegan. So rich and fudgy. I topped mine with a chocolate ganache and strawberries. You won't be able to manage more than one. Thank you for the recipe! All I can say is that these are incredibly rich , gooey and delicious. Better than traditional. Would coconut oil be OK to replace the butter? I never buy any kind of vegan butter as what i have in this country isn't that great. I made these last night with some modification. I didn't have golden flaxseed or vegan butter. (South Africa is very limited with vegan supplies.) I used 1 Tbs of soya lecithin and 1 Tbs of psyllium huske with 6 Tbs of water to make the fake egg and 3 Tbs of coconut oil plus 3Tbs of sunflower oil to replace butter. Very nice,, thank you. These were amazing! I probably used 3/4 cup of water though, and i put into muffin pans for the same time and temp. My friends liked them too. Crispy on outside, soft on inside. I also used 6tbs macadamia oil instead as i didnt have butter or time to make. Thank you! Incredible! These brownies are AMAZING. My first batch came out perfect and was literally gone in two days. Definitely will be making these again! I have made this recipe several times in the past year, and it has consistently been enjoyed by both vegan and omnivore friends (even the time when I forgot to add the vanilla and then poured it on top of the dough in the pan, hoping for the best). I'm not vegan, but my roommate has a seriously allergic reaction to dairy. I accidentally "poisoned" him with some buttermilk biscuits that I made the night before. I wanted to say "I'm sorry" through making him something delicious, something spectacular and non-dairy, something that would have him saying, "moo?" No, no moo, but yes, yes delicious. These brownies were amazingly good! I followed the recipe to the T, with the exceptions of using coconut oil instead of vegan butter, and baking for only 20 minutes instead of 25 (darn electric ovens are weird). The author wasn't kidding when he said that these brownies needed to cool completely. My roommate and I tried them after an hour cooling, but the texture was definitely best after letting them cool over night (about 12 hours). I'm going to attempt to add chocolate and white-chocolate chips to my next batch, in addition to the walnuts I added last time. Thank you so much for this recipe - I don't think that I'll ever make non-vegan brownies again! Is baking soda bicarbonate of soda, or is baking soda the name give to baking powder in America? Or does i not matter? All these similar names are so confusing! Sorry for the confusion Charlotte! Baking soda is the same as bicarbonate of soda. Baking soda reacts with some of the acid naturally present in the recipe (mainly the acid present in the cocoa-based ingredients in this recipe) to provide an extremely small amount of rise. No baking powder is required in this recipe. Just for the record, baking powder consists of baking soda along with an acidic ingredient (and other carbon dioxide generating ingredients) that, when combined with both water and heat, generate a specific amount of carbon dioxide that assists rising while baking. Generally speaking, baking soda works well for providing adequate rise when there is sufficient levels of acidic ingredients present in the recipe. When acidic ingredients are lacking, baking powder is more frequently used. Happy brownie baking! I've tried so many brownie recipes before that it was with a jaded and cynical eye that I regarded the "Ultimate" in the name of these brownies. But I swear by the old gods and the new that ultimate is what they are! Look no further! The quest is over! They're perfect! You know in Vegucated when Marisa Miller Wolfson is shoving her face with amazing vegan food? That was me yesterday with these brownies! I knew I was done for after practically licking the bowl clean. Great recipe, the only one I'll use from here on out. Being vegan for a third of my life, I have never found such a perfect brownie recipe as this. Every vegan brownie recipe I've tried has been too "cakey" or too dry, but this recipe is the absolute BEST. Ooey and gooey in the middle, with a nice crust on top with just the right amount of crispness, I've never found such a perfect vegan brownie recipe before now. I didn't have any espresso powder, but they still came out amazingly perfect. The best part is, it's made with so few and such simple ingredients that you can pretty much make these whenever the chocolate cravings hit! Okay this is AMAZING. I had tried a few other vegan brownie recipes and only ended up with weird goop or fluffy tasteless muffin brownies. The flax mixture and semisweet chocolate pieces are a GAMECHANGER. I didn't even use a mixer and only had raw sugar on hand (something that usually ruins my recipes) and it STILL came out like gooey Mrs Fields brownies. Best ever! Thank you! Gorgeous tasting brownies! Mine passed the toothpick test after only 17 mins in my fan assisted oven, even though I had my oven thermometer in there for safety. Good thing I checked on that fantastic brownie smell wafting the kitchen!! I'm not actually vegan, I just have several allergies that restrict my use of common non-vegan baking ingredients. I make these brownies for my significant other and myself. He tries to stay healthy and doesn't snack often, but he always makes exceptions for these! I have made them numerous times over the past few years. I usually cut the sugar down to one cup or less, but today I am trying to add a bit more. 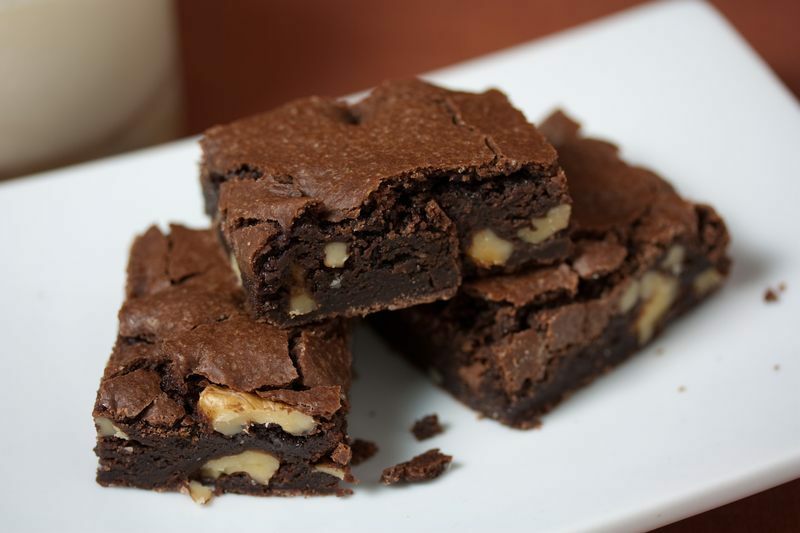 We enjoy the texture of these brownies-they are very dense and chewy. Not cakey at all (which I love. If I want cake I would make cake). Thanks for the recipe! Wow why haven't I left a comment on this one yet..? Well here it is! I've tried many vegan brownie recipes over the past decade with pretty good success. After trying and falling in love with this one last fall I need not to ever experiment with another brownie recipe again. This is fail-proof, always comes out very fudgy with that lovely thin crusty top. The brownies keep moist for many many days. I would recommend this recipe for anyone who wants a traditional decadently fudgy (not cakey) brownie which doesn't skimp on the sugar, chocolate and fat! And it doesn't have any crazy or overly expensive ingredients (especially if you leave out the nuts). Five stars!